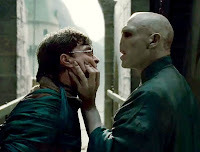 WARNING: This article contains a brief, but pretty major spoiler for “Harry Potter and the Deathly Hallows: Part 2,” If you care that much, I suggest you stop reading now. When “Harry Potter and the Deathly Hallows: Part Two” concluded, a saga that had lasted over a decade had ended. Some people in the audience cried, others cheered, and pretty much everyone clapped wildly. For these people, it was a truly emotional moment. Me? I made a fart sound with my mouth. Maybe my reaction was a little bit immature. However, it summed up why I could just never get into this series. No matter how eye popping or imaginative “Harry Potter” could be, it just never clicked with me, whether in novel or film form. My indifference to “Harry Potter” was never too personal. I read the first two books, and thoroughly enjoyed them. I saw the first two movies, enjoyed those, too. The series started to lose me around the fourth film, though I have always appreciated the increasingly dark tone of the series. Looking back on it, the “Harry Potter” series did many good things. Most importantly, J.K. Rowling inspired children not only to read, but to enjoy reading, and to want to read, and to finish a book that was over 800 pages in one sitting. Even Dr. Seuss and Roald Dahl would have had trouble pulling that off. I never made it to the seventh book, and after giving up on movie number four, I only saw the second half of the seventh film (longest second act, ever). Harry’s original story, as a misfit who doesn’t understand his potential power is easily relatable to any young teen trying to figure out who they are. I could relate to this (no, I am not a wizard and no, my parents never forced me to live in a closet under the stairs). Yet, no real emotional connection ever forged between me and the young witches and wizards of Rowling’s universe. When I was younger, I became attached to certain sagas and passed over all others. The world of “Harry Potter” never appealed to me. I tried “The Matrix” for one film and while I love “Star Wars” I could never call myself a fanboy. Rather than obsessing over Potter, I spent most of elementary and middle school as a “Lord of the Rings” geek. Later on, it was the two part universe of “Kill Bill” that somehow got the best of me and made me embark on my never-ending journey to watch every movie I could find at the public library. “Harry Potter” has always felt strangely cartoonish to me. Even in its most serious moments, I never got a grasp in my mind that this world of magic could actually exist, that Hogwarts was a place I could put myself into. As far as the movies ago, I was never a fan of its mentality of making a gripping and dark action scene and then trying to end it with a light-hearted moment. That one little one liner would always devalue some of the previous scene’s seriousness. That’s just taking the idea of comic relief too far. Maybe it’s just an English thing. At this point you are probably wondering: where the hell is my review? I just spent $10.50 and two and a half hours of my life on this movie, so shouldn’t I have some clear, formulated opinion? Well, here it is: “Harry Potter and the Deathly Hollows: Part 2″ is a highly entertaining summer blockbuster. Its special effects are dazzling and show the very best Hollywood has to offer in the latest CGI. This film shows how much the series has changed since its humble roots. However, if this is your first “Harry Potter” film, or your first “Harry Potter” film in quite some time, then you will not find yourself enjoying it so much. I would offer another big blockbuster for you to see but unfortunately, the only other ones currently out are sequels. So instead, I’ll request you go watch the pristine images and dinosaurs in “The Tree of Life.” That’s what you get for not liking “Harry Potter” more, you resentful jerk. Anyway, there are some things I really do like about “Harry Potter.” I really like what the series did with Snape. I also admire the film’s special effects, which are the moviemaking equivalent of magic. The CGI felt organic, not forced. But because this film took place in the middle of a story that I was never involved in, I don’t feel I can properly review this film to the highest degree. Therefore, I leave you with these last two paragraphs. When some people walked out of “Harry Potter and the Deathly Hallows: Part 2,” a piece of their childhood ended along with the franchise. Everyone my age grew up alongside the “Potter” kids. Their awkward changes once they hit puberty only rivaled our own. For me, once the screen faded to black, I just continued living from where my life had left off right before the film. However, I did feel an immense sting of disappointment that I didn’t stick around for the trailer for “The Dark Knight Rises” that played following the credits. This entry was posted in British, Childhood, Fantasy, Harry Potter, Harry Potter and the Deathly Hallows Part 2, J.K. Rowling, Movie Review, The Dark Knight Rises on July 17, 2011 by ian0592.